Increased awareness of food miles, environmental impact etc have lead to many folk looking at old fruit trees in their gardens to think; “What can I do with all the extra apples (or pears) from these trees?” Pressing them to produce a load of lovely fresh apple juice is actually not difficult, and it’s a great activity for the family or community*. Bulk storage (in your freezer) means you could have your own home-made apple juice for months to come – and you will have done it all yourself! a. Each mature standard apple tree is capable of yielding approx 250 Kg of apples (depending on variety), which equates to just under 300 litres of crushed apple pulp (pomace). And a smaller cordon or bush tree can yield up to 50 kg of fruit. b. Depending on how the fruit is pulped, and the pressing time; a minimum of 50% juice yield should be expected, so a small tree could give you approx 20 litres of apple juice, and a productive mature standard tree, around 100 litres! c. If the fruit is well pulped, each pressing should take approx 20 minutes. 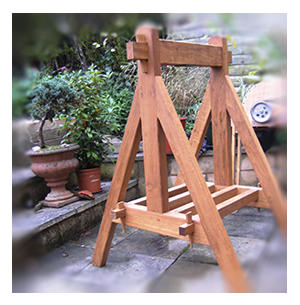 All our presses are made from the same basic design consisting of 2 substantial “A” frames holding the top bar and 4 lower rails, all solidly retained by tapered pegs and finished with Teak oil. This oak structure must be capable of withstanding considerable forces in order to apply sufficient pressure on the pulp – typically 100 lb/sq in (psi) across the surface of the pulp. The pressing barrel is retained by 2 steel bands protected by a Hammerite finish, and sits on a slatted base. The base is made from marine ply topped with a food safe grade plastic. * The edges, as well as the barrel staves are made from beech wood. 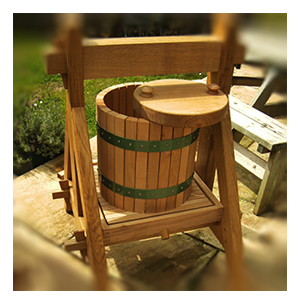 Stainless steel screws are used throughout with the main pressing plate and load spreader made in Oak. All woodwork is finished with food safe oil compliant with current regulations. Here is my up-dated apple mill / grinder which produces a better pulp for improved yields when pressing. My gratitude to Claude Jolicoeur in Canada for the original concept; I hope I have done you justice with this model. More details on construction can be found on my Flickr page: http://www.flickr.com/photos/88213977... . Any feed-back would be welcome; Have a good cider season! 40 & 50 Ltr models have 150 x 100 top rail. Fruit juice yield will increase marginally with barrel size, depending on variety and “ripeness”. 6 slat boards & cloths are provided together with a former to assist with loading each cheese. Cheese style presses can be made larger to suit your requirements, and have improved yield efficiency over barrel types. This is because the juice is forced outwards and down the side of the rack as opposed to just “down” the barrel. Prices start from £425.00 for the 20 Ltr barrel press; with delivery extra at cost.